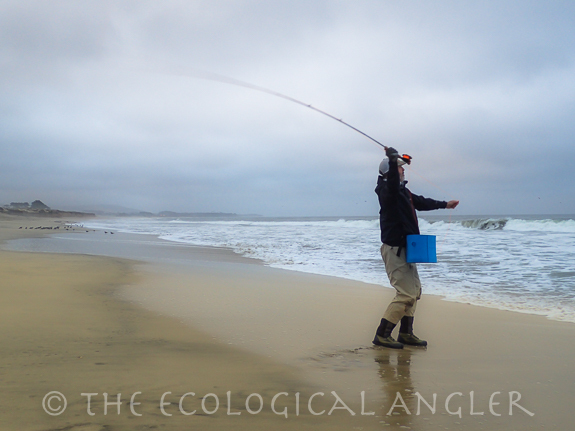 With miles and miles of beach in California, where do you fish? One feature to look for is a rip. Rips typically run straight out (i.e., a right angle) from the shore. When the water from a wave recedes, look for a section to tunnel out faster. The contour of the beach essentially pinches the water like a slot in a stream, forcing the water to move faster. Work your flies along the edges of the rip similar to a seam where faster current meets slower current. Sand crabs occupy the top position in the food supply for most of the fish in the surf zone. These small crab are abundant and consistently present along California's sandy beaches. 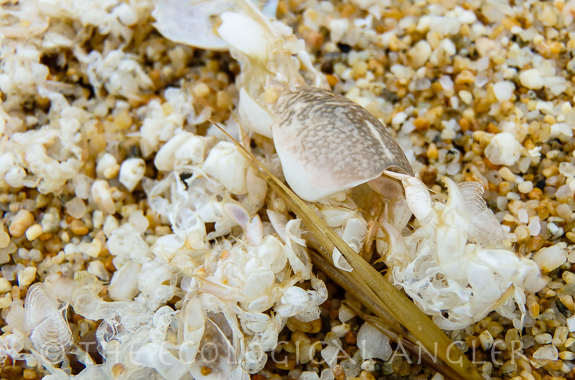 The photograph above shows the discarded shell from a sand crab that recently molted. Seeing evidence of sand crabs is a big plus - think of a stream with a big hatch going off. 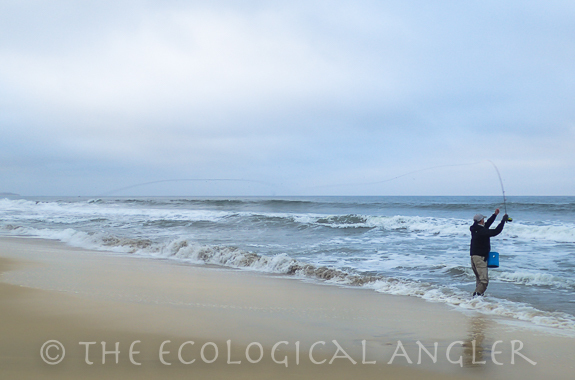 Unlike most trout streams, fishig the surf demands longer casts (e.g., greater than 60 ft.). A couple of things will help boost your casting. One, if you are starting out, think about using an 8 wt. rod. The heavier rod combined with a sink-tip naturally increases the horse-power of your casting. For a sink-tip, I use a Teeny T-300 which is a 24 ft. section of sinking line attached to 66 feet of floating line. The line sinks quickly at 6.5 IPS - getting your fly down near the bottom where surf perch feed on crabs and worms. Surfperch will happily take flies in the surf. Barred surfperch are most common species found in the surf colored olive green to yellow green on the back becoming silver below; with bronze, brassy or yellow vertical bars and spots on the side. This surfperch is one of three living off sandy beaches with similar color markings; however, it can be distinguished from the other two (calico and redtail) by its lower jaw being slightly shorter than the upper (pictured below), and by the absence of red or reddish color on its fins. Although generally small in size - ranging from 4 inches up to 18, these fish fight much bigger. Warning: hooking and fighting a surfperch can be addicting! Since these fish tend to feed in schools, the hook-ups can come with every cast if you fishing a hole. The take is a light tap, tap, tap - usually followed my a pull. Casting in the surf can be challenging. The summer months are a good time to head to the beach. The swells tend to be in the 4 to 6 ft. range. Smaller swells are not only easiler to fish, but way safer if you are just starting out. I always approach the ocean and the surf with respect. When casting look to shoot your fly behind the wave as it breaks. Although the sign pictured above warns of DANGER, a surf fisherman will welcome it. 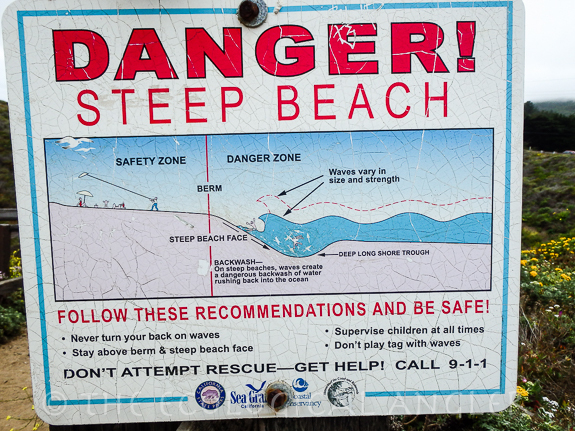 The sign depicts a beach below with a huge trough running parallel to shore. Troughs are prime structure to fish with a fly rod. As the waves roll in, the water at the bottom of the trough can hold fish. The troughs will churn with current that breaks crabs and other food free from the beach. The constant churning makes it difficult for food to escape and a great place to mix in your fly. Low or no light will certainly work in your favor when fishing the surf. The hours around sun rise or sun set can not only be really productive, but watching the light and colors of the coast change is a really nice bonus. Fly fishing the California Coast is similar to what they say about mountain trout streams - fish don't live in ugly places! Looking out on the horizon while stirpping a fly, can also be addictive. The scene is constantly changing. I've also had the fortune to watch humpback whales, and brown pelicans actively feed in front of me for hours while not catching a single fish, and really not caring. The past couple of summers (including 2016), the humpback whales and company have been drawn close to he Central California Coast for one reason - Anchovies. Lots, and lots of Northen Anchovies can be seen darkening the water. 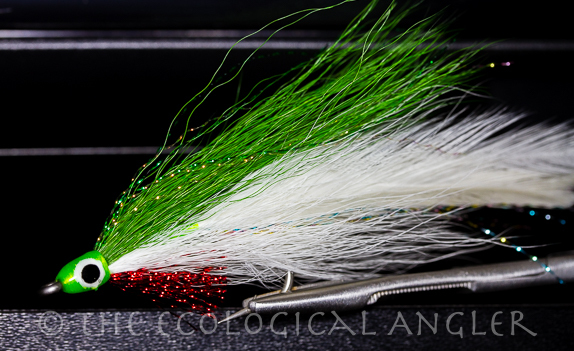 When the pelicans, gulls, and other birds start actively feeding near the surf, think about fishing a bait-fish style fly like the white and green/chartreuse Deceiver pattern. 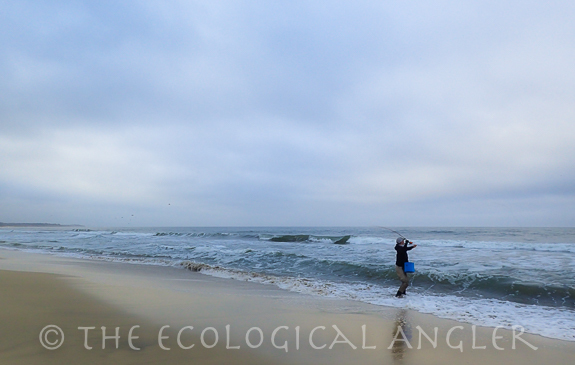 In some years, large numbers of striped bass migrate into the Pacific Ocean and many are caught just off the beach by surf anglers. Surf fishing from the San Francisco beaches south to Monterey is occasionally very successful during the spring and summer. Probably the most important piece of equipment for fly fishing California's surf is a stripping basket.The constantly moving and changing water will test your line management skills unlike anything you have experienced in freshwater. Having a stripping basket keeps a barely sane situation from becoming insane. You'll have plently to focus on in front of you without having to look down and untangle fly line from your feet. Believe me, a stripping basket will be your biggest friend in the surf zone. The California surf hosts a variety of surf perch. The Redtail surfperch (photographed above) are numerous from the greater San Francisco area beaches and range as far north as British Colombia. Many other species of soles and flounders can be caught in the California surf using a fly rod, including petrale, Pacific Sanddab, sand soles, and the highly prized Calfornia Halibut.